The Beating Heart Festival, part of My Mississauga, is Mississauga's only summer festival that highlights the wealth of solid independent music in and around the G.T.A. Most of these bands have taken significant pay cuts in order to bring fantastic music back to the city core. Exclaim! Magazine is official sponsor of the festival this year. Come out and relax; bring friends, and enjoy some of the best music in the G.T.A, outdoors, every Friday evening, right in the heart of the city, entirely for FREE. Visit the links below for more info and to check out the acts. We're also on Facebook. 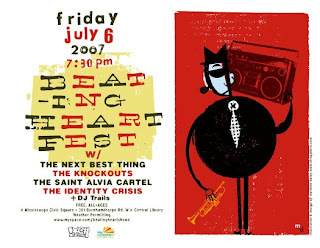 Search for, "The Beating Heart Festival" and add us!The Beating Heart After-Party Series will be returning to the Duke of Marlborough this year. Make sure to check out: www.myspace.com/thedukeofmarlborough905 to stay up to date on upcoming shows and possible secret guests.